NEW YORK – Internet cooking sensation Laura Vitale celebrates food with simple, seasonal meals on Simply Laura, premiering on Saturday, September 27 at 1:30 p.m. ET/10:30 a.m. PT on Cooking Channel. She shares her easy, enticing recipes that not only feed the stomach, but also the soul. Whether it is a mouthwatering brunch for friends, or a crowd pleasing supper that is ready in a flash, Laura shows the power of a hearty meal to bring friends and family together. In each of the six half-hour episodes, Laura shares her personal stories as well as fresh, flavorful recipes. In one episode, Laura prepares the perfect “Best Friends Brunch.” Everything about her brunch is easy, so Laura can enjoy the company of her friends once all the cooking is done. She begins with her light and crispy Belgian Waffles topped with her famous savory Sausage and Apple Hash. For a side, she prepares a delicious Roasted Fig Salad with Goat Cheese, Arugula and Prosciutto. Since no brunch is complete without a special drink, Laura tops everything off with a refreshing Orange & Raspberry Mimosa. In another episode, Laura takes viewers on a very personal journey through some of her grandmother’s favorite dishes. This heartwarming meal will bring the flavors of Italy to Laura’s kitchen. First on the menu is her Nonna’s hearty Pasta al Forno with Mini Meatballs with a side of Spicy Broccolini. She saves the best for last, with a zesty Orange Bundt Cake with Mandarinello and Blackberry Compote topped with Mascarpone Cream for dessert. Throughout the series, Laura spreads love through her food with her easy to make dishes that are sure to impress. Fans can join Laura online at CookingChannelTV.com/SimplyLaura for exclusive webisodes featuring additional recipes that accompany the meals each week. 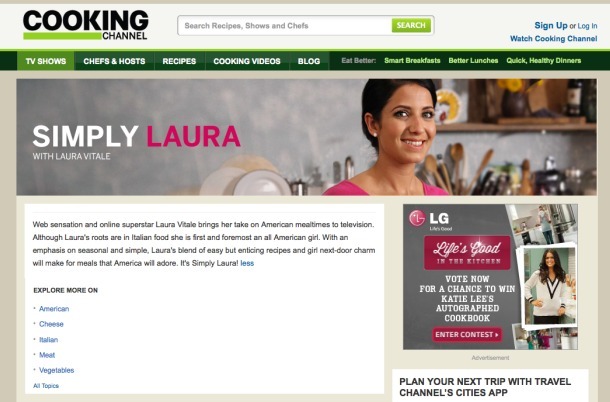 Fans can also connect with each other and the show’s star on Facebook at Facebook.com/CookingChannel and on Twitter with the hashtag #SimplyLaura. Internet sensation Laura Vitale moved to the United States when she was 12 years old. As a teenager, she developed her love for cooking from her Italian grandmother, learning many of the recipes for classic Italian dishes over the phone. She began working in her father’s restaurants in her teens, but after they closed in 2008, she wanted to find a new way to continue to share her passion for cooking. In 2010, Laura began a new phase of her culinary career when she started her internet cooking series Laura in the Kitchen. 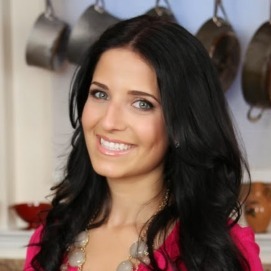 The series quickly became a hit and now boasts an audience of over 2 million and quickly growing, making Laura a well-known name in the cooking community.